Dolby Digital sound tracks almost always appear on DVDs. That's because Dolby Digital is one of the three audio systems of which at least one is required by the DVD licensing agreements. If you read US publications, they will talk about there being only two: Dolby Digital and linear PCM. PCM – Pulse Code Modulation – is the uncompressed digital standard used on CDs, although when it is used on DVDs it tends to be at the 48kHz sampling rate rather than CD's 44.1kHz, and may be as much as 96kHz with 24 bits of resolution. However the third alternative is allowable outside the United States: MPEG audio. 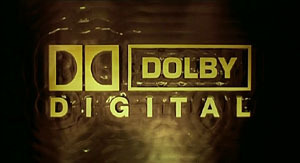 A few titles, particularly from Roadshow which was early on the Australian DVD scene, appeared using MPEG, but the lack of equipment supporting MPEG decoding, and the space consumed by PCM (stereo 48kHz PCM uses the same amount of space as full rate DTS) soon made Dolby Digital the de facto standard. Many people think that Dolby Digital necessarily means 5.1 channels, but that is not so. Dolby Digital is a compression technique, just as DTS and MPEG. As with DTS and MPEG (and Meridian Lossless Packing which is used on DVD Audio), Dolby Digital can support as few as 1.0 channels. It does, however, have an upper limit of 5.1 discrete channels, while DTS is apparently unlimited and MPEG can support up to 7.1. The DTS 6.1 ES Discrete format is likely to be the highest number of channels used. The Dolby Digital 6.1 system (technically, it's THX 6.1) does not have a discrete centre rear channel, but has the centre channel information encoded into the regular left and right surround channels in the same way as the Dolby Pro Logic centre channel is encoded into the front left and right channels. DTS 6.1 ES Matrix uses a similar system. Rather than referring to 5.1, 4.1 or whatever channels, I prefer to refer to 3/2.1, where 3 is the number of front channels, 2 is the number of discrete surround channels, and .1 is the low frequency effects channel. The reason for this is that 4.0 could equally refer to front left and right and surround left and right (2/2.0), or three front channels and one surround channel (3/1.0). Both are perfectly allowable within Dolby Digital. In case you're wondering, actual 2/2.0 DVDs are rare, although I have three samples I picked up in the Kowloon Markets early in 2003. Some examples of 3/1.0 are Midnight Cowboy, Miller's Crossing, Journey to the Center of the Earth and Season 1 of NYPD Blue. Equally, the .1 can appear in the absence of some of the other channels. Thus the Image Entertainment version of The Terminator (a US DVD, but one that is not region coded), has its mono sound track recorded as 2/0.1, all the better to deliver that bass theme. Even with this nomenclature, not everything is clear. For example, of the 177 mono DVD sound tracks I have checked, 59 are in 1/0.0 format, 117 are in 2/0.0 and the remaining one (the aforementioned The Terminator) is in 2/0.1. Delivering a mono sound track as 1/0.0 has the advantage of saving disc space, leaving more for the picture. So 24 of those 1/0.0 tracks use just 96kb/s, 34 use 192kb/s and Destination Moon, for some unaccountable reason, uses 256kb/s. But delivering mono sound as 2/0.0 means, usually, that the sound will come out of the generally better main front speakers rather than the centre channel speaker which, in many inexpensive systems, is rather inadequate. With many systems, you can force your receiver to play 1.0 tracks in stereo (ie. the same signal from both main front speakers). Of the 117 mono tracks in 2/0.0, 103 do just this. But the other 14 derive neither the advantage of a low bit rate nor the use of potentially better speakers because the two channel Dolby Digital bitstream carries a Dolby Pro Logic flag, so in many receivers Dolby Pro Logic will be switched on and the sound will come out of the centre channel anyway (since under DPL, any identical sounds from the front two channels are routed to the centre channel). An example of this is Disney's The Sword in the Stone, in which all six sound tracks are mono, but delivered in 2/0.0 with a DPL flag, each consuming 192kb/s. Not all home theatre receivers automatically act on a DPL flag in the Dolby Digital bitstream (Denon receivers, for example, don't) and Dolby Laboratories specifies this as an optional function. But a flick of the stereo/surround switch on all receivers can make it do whichever you want.